Transparency Market Research in its recently published report on the global cardiac prosthetic devices market states that the market is extremely fragmented because of the presence of a copious number of players – both existing well-entrenched ones and upcoming ones. To stay ahead of competition in such a market, players are seen banking upon product development by leveraging the latest technologies. Some of the companies that have come of hold substantial share in the market for cardiac prosthetic devices by banking upon the aforementioned and other strategies are Boston Scientific Corporation, Edwards Lifesciences Corporation, Sorin Group, Medtronic, Inc., and St. Jude Medical. The report finds that rising at a healthy clip, the market’s estimated valuation would be US$5,290.0 million by 2019. Cardiac prosthetic devices can be broadly classified into heart valves and pacemakers. While the pacemakers can be further segmented into heart valves and pacemakers, the heart valves can be further segmented into tissue heart valves, transcatheter heart valves, and mechanical heart valves. From a geographical standpoint, North America at present holds a leading share because of the superior technology, updated infrastructure, and presence of well-trained healthcare professional. Another factor stoking the market in the region is the rising instances of cardiovascular disease and sound healthcare and reimbursement policies. Cardiac prosthetics devices supplant diseased or damaged part of a body – they mainly find usage in tackling of blockages in heart valves. “Cardiac prosthetic devices implants are being widely adopted owing to the growth in the patients’ pool having valvular conditions. Prosthetic valve endocarditis (PVE), mechanical hemolytic anemia, prosthetic valve thrombosis (PVT), and thromboembolism are to name a few complications resulting from the failure of primary valves,” explains the lead analyst of our report. 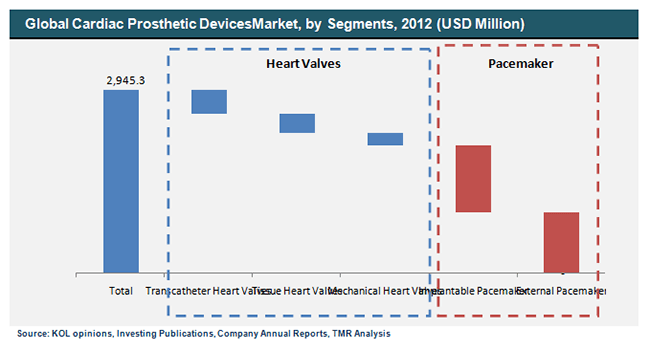 In addition to the surging cases of blockages in heart valves, the market for cardiac prosthetics devices is also being boosted by the continued thrust on product development. Major players are seen pouring money into research and development of better devices built from superior materials and underpinned by more sophisticated technologies. On the flipside, the market is being negatively affected by the expensiveness of the products and the associated procedures.